Room Smart's Charley dresser provides lots of storage room for clothing in 3 deep, wide drawers. The dresser is Modern Ash natural woodgrain, except for the top drawer, colored in contrasting white, which adds a refreshing design element to the bedroom! Built to last for years, the dresser is made of high-density MDF boards, and joined with heavy-duty steel hardware and drawer slides, so drawers won’t sag or fall off-track with normal use. The premium veneer finish is easy to keep clean, and resists stains, scratches, and fading or yellowing from UV rays. Besides providing lots of organized storage in your child’s room, the dresser colors allow easy coordination with bedroom themes and color schemes as your child’s tastes change through the years! Contemporary style: the Simple design and light natural color create a dresser that will Grow with your child's changing tastes and Bedroom colors! 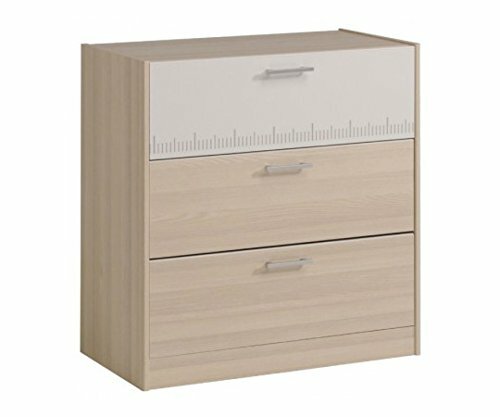 Sturdy Construction: built to last, from high-density MDF boards and heavy-duty Steel hardware and drawer slides, your dresser drawers won't sag or go off track with normal use.